We woke up early and had a great breakfast at our hostel. Most importantly, we had coffee. Our walk was flat and steady most of the day. There wasn't quite as much road walking as yesterday, so we were thankful. 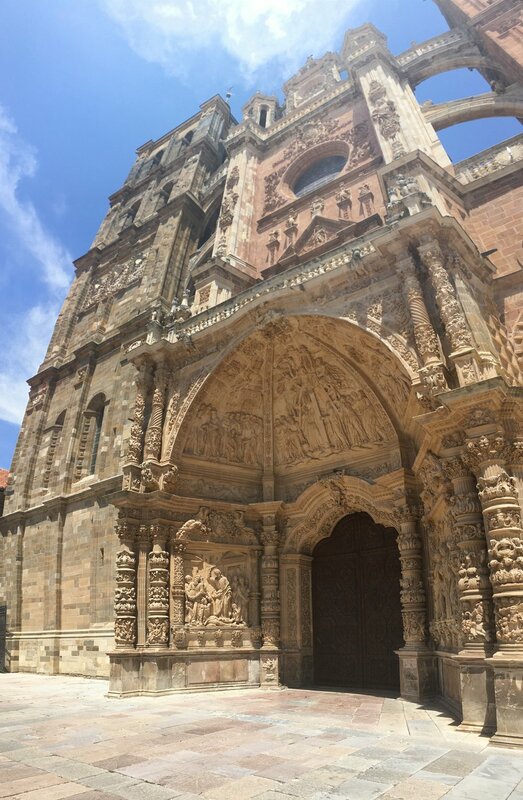 We heard great things about Astorga. Rumor on the trail was that this city had a castle and a chocolate museum. Needless to say, we were pretty excited to get there. When we arrived in Astorga, we decided to stay in the municipal hostel, which is usually the cheapest option for pilgrims and holds the largest number of hikers. Being a Friday, most of the hotels in Astorga were booked, so we didn't really have a choice. It turned out to be pretty decent. The hostel is a converted hospital, so they could only cram two bunk beds in each room, which meant only four pilgrims to a room! Mom was super excited about the favorable odds that no one in our room would snore. After showering, we headed into the main plaza to grab a beer and a bite to eat. We diverged from the usual Spanish tapas and ordered nachos. Oh my, it was a glorious decision. We were skeptical of the sour cream at first, convinced it was actually goat cheese, but thankfully it wasn't. We walked around and checked out the impressive cathedral and palace. Unfortunately, the tours were 50 minutes for each and that's just too far out of my attention span, so we (I) had to pass. When I walked into our dorm room after showering, there was a German girl lathering up with bug spray. It appeared she had just gone to the pharmacy and bought every product from the bug repellant selection. I said hello and she said "there are so many mosquitos here! I'm covered in big bites". She showed me her bug bites and I knew, from experience, that those were not mosquito bites, but rather bed bug bites. Horrified, I immediately moved my backpack as far away from hers as possible. I tried (and probably failed) to not to act disgusted, but the thought of getting bed bugs again was not appealing. I said an extra prayer that night that her bed bugs wouldn't jump ship. We were trying to fill the awkward gap between showering/tapas and dinner, so we walked down the hill to the chocolate museum. When we finally got there, we were devastated to find that it was closed. Of course it was closed- it's siesta time aka nothing is open. We're such dinguses. Classic gringo mistake. It was a very sad walk back up the hill. A pilgrim service was offered at 8:30pm tonight and although I was tired from our hiking and sight-seeing and pasta and pastry eating, I decided to go. It was unlike any church service I had ever been too. The service was spoken in Spanish and English, but the program was written out in eight or so languages. We shared spoken and unspoken prayers and were invited to come together up front to say the Lord's Prayer in our native language. It was so meaningful to share faith with people from all over the world- all so different, but sharing one path.